Today, insurance is a key part of a solid financial plan. You can use life insurance to leave much-needed income to your survivors, provide for your children's education, pay off your mortgage and simplify the transfer of assets. Furthermore, life insurance policies are commonly used to fund agreements for transferring ownership interests in small businesses or compensate a business for the loss of a person critical to the firm's success. It can also be used to replace wealth lost due to the expenses and taxes that may follow your death, and to make gifts to charity at relatively little cost to you. Additionally, there is a good possibility that you or your spouse may experience lost wages from a short or long-term inability to work and will eventually require some sort of long-term care. According to the Social Security Administration, a 20-something worker has a 30% chance of becoming seriously disabled before reaching retirement. The U.S. Department of Health and Human Services points out that about 70% of people aged 65 or older will enter a nursing home for some period of time during their lifetimes. Generally, people purchase term insurance policies to insure their families for a given period of time – usually no longer than 15-20 years. For example, term insurance is often purchased by home owners carrying a mortgage or by parents of young children. 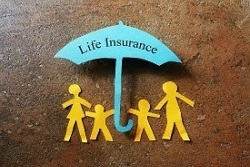 Term insurance is also referred to as pure insurance as it consists of benefits only. Because of this, term insurance is comparatively inexpensive. If your insurance needs are longer than approximately 20 years, it may be more cost effective to consider whole life or universal life types of permanent life insurance. These types of insurance contain an investment component and can allow you to accumulate savings on a tax-deferred basis. Some allow you to borrow against any cash value you have built up in the policy. Disability insurance addresses lost wages that stem from an inability to work. These insurance policies may address either short-term or long-term needs for income. Short-term disability policies provide coverage on a temporary basis, usually up to several months to tide you through while you recover from an accident or illness. Long-term insurance provides benefits of a more permanent nature. Most long-term policies will cover you throughout your working years, usually until you reach age 65. Policies vary in terms of cost of premiums, the percentage of your prior salary paid out as a benefit and the definition of what constitutes a disability. Long-term care insurance goes beyond medical care to include all the assistance you could need if you ever have a chronic illness or disability that leaves you unable to care for yourself for an extended period of time (longer than 90 days). It is designed to help cover costs of health care services provided to you in your home, a nursing home, a rehabilitation center, or an assisted living facility – each with varying daily and monthly costs. Loss of wages typically is not an issue with this type of coverage. With long-term care costs typically rising each year, these expenses can be expected to grow substantially over time. Furthermore, neither Medicare or Medicare supplemental coverage, also know as Medigap insurance, typically cover long-term care. Therefore, with some exceptions, most people who need long-term care must pay for some or all of it on their own. Since the prediction by the U.S. Department of Health and Human Services that up to 70% of people aged 65 or older may enter a nursing home for some period of time, there is a good possibility that you or your spouse will eventually require some form of long-term care. Whether you or your spouse will be among this group is impossible to predict. But it is wise to consider how you might pay for long-term care and whether long-term care insurance is a good idea. There is no age threshold beyond which long-term care insurance is not available. However, with increasing age it may not be affordable. It makes sense that the less time between taking out a long-term care policy and drawing benefits, the higher the premiums will be. And, applicants can be turned down due to preexisting medical conditions. Deciding to purchase long-term care insurance will depend on your personal situation. You may want to consider your family health history, your level of assets to potentially pay for long-term care, and your feelings about relying on family members for support. Whether you already have life and/or other insurance policies or are considering options to protect yourself and your family it may benefit you to consult with your financial professional to help with an insurance policy needs review to make sure your existing and/or future policies fit your current goals and financial plans. Because of the possibility if human or mechanical error by Wealth Management Systems Inc, or its sources, neither Wealth Management Systems Inc. nor its sources guarantees the accuracy, adequacy, completeness or availability of any information and is not responsible for any errors or omissions or for the results obtained from the use of such information. In no event shall Wealth Management Systems Inc. Be liable for any indirect, special or consequential damages in connection with the subscriber's or others' use of the content.